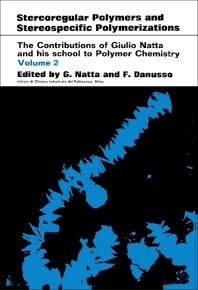 Stereoregular Polymers and Stereospecific Polymerizations, Volume 2 covers the reactions and physico-chemical properties of various polymers. This volume is divided into 88 chapters, and starts with the survey of the molecular structure, stereospecific polymerization, and reaction kinetics of styrene. Considerable chapters are devoted to copolymerization reaction, crystallinity of block copolymers, and molecular weight and isotactic behavior determination. Other chapters examine other polymer properties, such as elastomeric activity, enthalpy, entropy, and resonance of energy. This book also considers the polymerization of vinyl monomers, conjugated diolefins, and butadienes. These topics are followed by presentations of various metallic complexes as polymerization reaction catalysts. The remaining chapters describe the proposed nomenclature of polymer products obtained from other stereospecific polymerization reactions. This book will prove useful to polymer chemists. 135. Crystalline Synthetic High Polymers with a Sterically Regular Structure (Introduction to papers 136—145).